In this quick tutorial you'll learn how to draw a Peppered Moth in 6 easy steps - great for kids and novice artists. At the bottom you can read some interesting facts about the Peppered Moth. 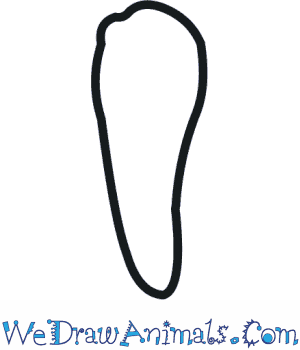 Step 1: First, draw the long, conical outline of the Peppered Moth’s body using gently curved lines. Make the body wider at the top and narrower at the bottom. 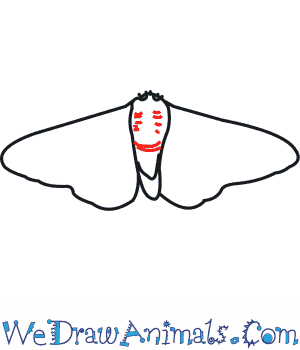 Step 2: Draw two half-circles at the top of the head for the eyes of the moth. 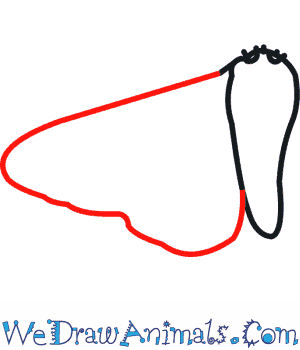 Step 3: Draw a rounded triangle shape for the left wing of the Peppered Moth as shown in the image. 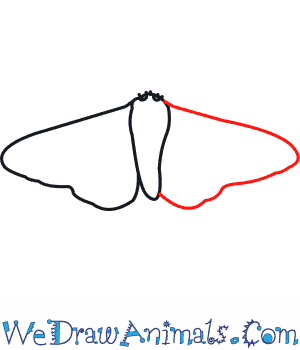 Step 4: Draw the right wing of the moth just like the other one. 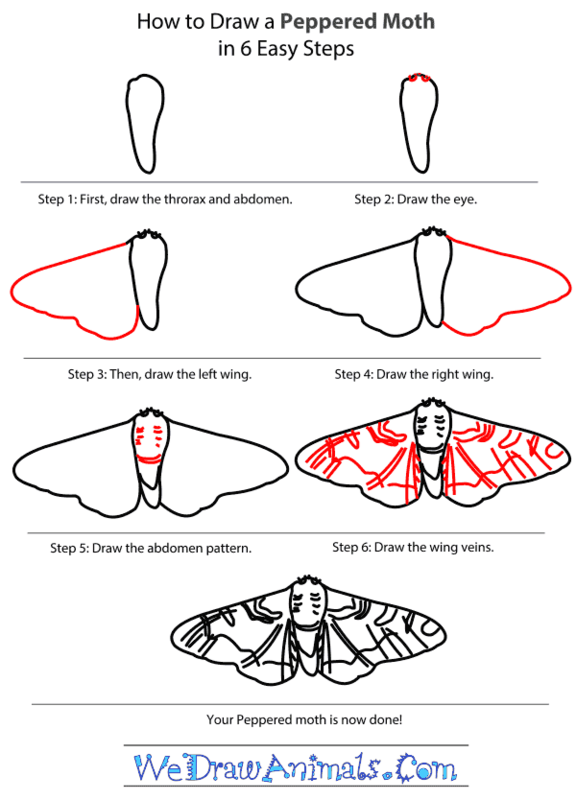 Step 5: Draw curved lines across the middle and bottom part of the Peppered Moth’s body. Add curved dashes on the top of the body. 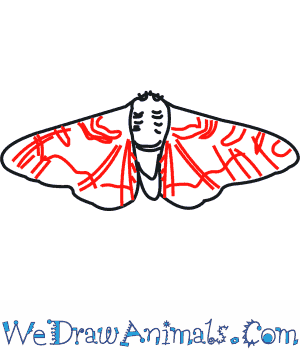 Step 6: Draw the wing markings of the Peppered Moth using straight, slanting and curved lines. The Peppered Moth has speckles or markings all along the edges of its wings and some markings across the entire wing. 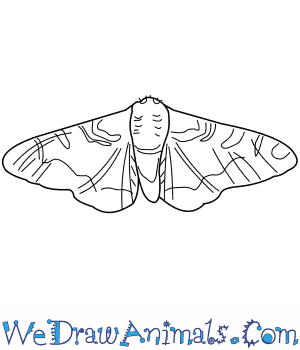 After your drawing of the Peppered Moth is complete, you can add shading details to show the speckling patterns. The Peppered Moth is found all across the northern hemisphere, from North America to northern Europe and central and northern Asian countries. It was first identified in the year 1758. The Peppered Moth flies mostly at night and has wings of black, grey and white speckles that look like the moth was dusted in black pepper. In Europe, the Peppered Moth produces a new generation once a year, but in North America a new generation is produced two times each year. The Peppered Moth caterpillar mimics a twig and can be any color between green and brown. Bats are one of the biggest predators of Peppered Moths. A male Peppered Moth will guard a female while she lays her eggs, so that other males cannot get close to her. A female Peppered Moth can lay over two thousand eggs at a time. During the Industrial Revolution in Europe, Peppered Moths evolved into darker morphs in order to better hide upon pollution-covered trees. Now that pollution is better controlled, the lighter colored morphs are again more numerous. The Peppered Moth has been an important animal in the study of natural selection because of the way generations changed the way they looked in order to survive.